St. Mark's Episcopal Church is located on Marco Island, a barrier-island which is rapidly developing into a suburban resort community. The congregation was established 30 years ago and is seasonal, conservative, and very traditional. The Church is trying to establish a more visible presence in the community, as the congregation was not growing, partially due to limited and worn-out facilities. Phase 1 of the building program began with a new Master Plan, then construction of a Parish Hall Building and new parking areas. Phase 2 required the complete reconstruction of the existing Church Building. The Master Plan that identified and solved many significant problems built into the existing site and its facilities. Before considering liturgical requirements, these and many other basic design problems had to be solved. The solution had to include a clearly identified and convenient entrance to the Church, correction of the parking and flooding problems, a new Parish Hall, and if possible, an element that would restore a "landmark status" to the Church. The design solution uses a curved driveway along the North side of the site to better distribute the parking areas, while preserving the familiar and appreciated front lawn. 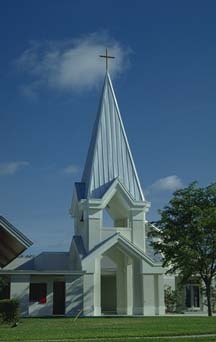 The new Bell Tower serves both as a landmark to all passing by, and as the new entrance to both the Church and Parish Hall. The new entrance is located at a midpoint in the reconfigured parking lot, convenient to both parking areas and linking the Church building to the Learning Center and to the Courtyard garden. St. Mark's Church is designed to reflect the main requirement of the Catch the Spirit Campaign- a complete transformation was needed while renewing the Church. The design solution did not, however, remove the original structure. The exterior elevations of the reconstructed Church were designed to work with, rather than against, the unusual roofline and proportions of the existing building, resulting in a design that extends the roofline in a similar manner without attempting to match the height of the ridge. The Altar addition is slightly lower than the original Nave, clearly providing a visually layered design that expresses the function of the spaces within. The main entrance to the old Church faced North, directly towards a busy, pedestrian-unfriendly thoroughfare, away from the parking lot, with a very long sidewalk around the side of the building. The existing grade required steps at the main entrance, making the front door of the Church difficult for many elderly members and completely inaccessible to the disabled. These problems were solved with the new Master Plan and reconstruction. Inside, the original building had many fundamental problems, including structural damages caused by Hurricane Andrew, and subsequent leaks. The layout of the building was crowded, acoustics were poor, and the existing lighting was inadequate. To use the restrooms during service, parishioners had a choice of 1.) walking past the pulpit and behind the altar table, 2.) walking through the pastors office, or 3.) leaving the building. The new plan solved all of these problems, and more. You can use the links below to find additional narrative descriptions and many more photographs of St. Mark's.